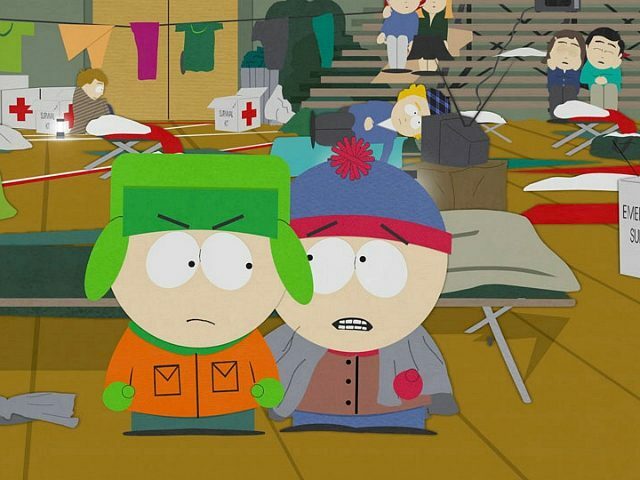 Comedy Central’s long-running edgy cartoon series South Park is set to debut it’s 22nd season with jokes about a school shooting, according to The Wrap. A promo clip ahead of Wednesday’s premiere, entitled, “Dead Kids,” shows Stan at the family dinner table and telling them all about his day, which included a school shooting. But even as Stan’s mom becomes despondent over the shooting, Stan and his father appears to be more interested in talking about the fact that Stan failed a math quiz. “Was it you?” Stan’s dad says after learning someone “shot up the school.” Stan says no, and his father adds, “did you get shot?” to which the child says no. “Well, what’s this about failing a math quiz,” dad concludes. “Sharon is overreacting to everything these days and Randy can’t cope in the season premiere titled “Dead Kids” on Wednesday, September 26 at 10:00 p.m. ET/PT on @ComedyCentral,” is how the official South Park Twitter account captioned a clip of the episode. The clip not-so-subtly implies that school shootings have become so common in America that it is barely worth mentioning. South Park’s season 22 debuts on Comedy Central on Sept. 26.